With above average cotton prices in 2011 and prices looking promising for 2012, NSW farmer Graham Cook has taken the opportunity to upgrade to an all-new Case IH Magnum 340 tractor. 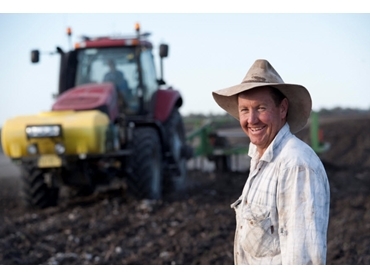 Across his 1,785-hectare property Graham grows 480 hectares of irrigated cotton as well as a mix of forage oats, barley and dry land sorghum on a second leased 1,200-hectare block nearby. Graham explains that his cotton farm has been through a lot in the last few years including low market prices and the biggest floods in history. Despite this, last season his yields were around 10 bales per hectare with a market price of approximately $900 a bale. Graham says “This year we’re looking at around 12 bales a hectare with prices at $500 per bale, which is still pretty good for our industry.” Which is why the investment in a new tractor makes sense. To date, the new Magnum 340 has completed more than 350 hours in the field, mainly spraying and ripping the country in preparation for planting. Graham estimates that the new tractor saves “…at least half a litre of fuel per hectare, which is a big cost saving across the operation. Contact Case IH or one of its expert dealers for more information about the Magnum 340 and choosing the most suitable tractor from the complete, all new Magnum and Steiger tractor range.